When you live near the Rock and Roll Marathon route, you can either try to get around the marathon, run it, or find away to enjoy it! We chose the last option and joined our friends, the B Family, for their annual water station. They are literally on the route so they are blocked in – which is a great excuse to hand out water and turn it into a party. We rode our bikes over to their house and realized that this was a well oiled machine. Tables with cups and a system for filling and then refilling the water jugs was in place. Not to mention a great spread of breakfast and bloody marys for the volunteers. It wasn’t long until the first few runners came by, then the big waves came. It was so neat seeing the various kinds of runners – everyone was working hard. The sweetest thing was that so many runners not only slowed down, but some stopped to take the water from the kids and thank them for being there to cheer and hydrate. It was so cute to see the excitement on the kids faces. Congratulations to everyone that ran! And thank you to all the runners who took time to say thank you, you made a lot of little kids very happy! 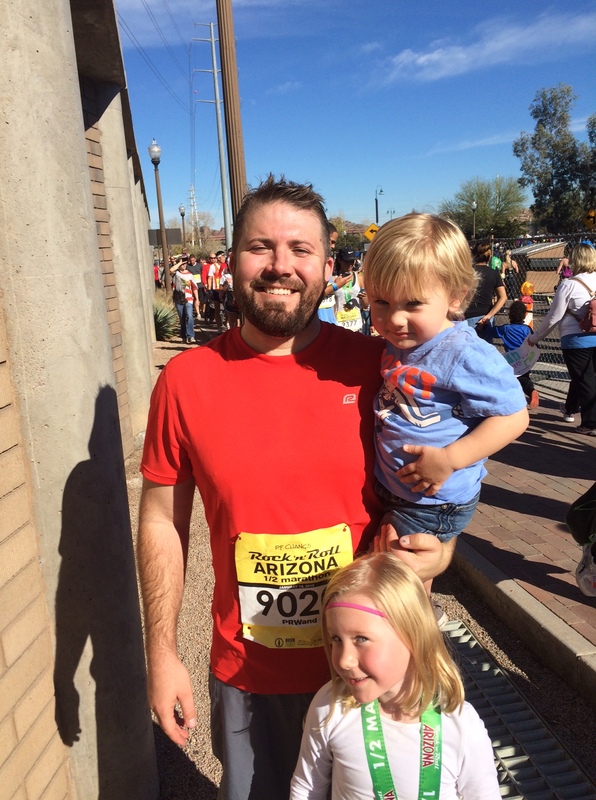 A HUGE congratulations is due to Peter for finishing the 2015 Rock n’ Roll Half Marathon yesterday! He finished just over 2 hours (which he is supremely unhappy with, because he’s him) with minimal injuries; a large blister, sore muscles, etc. The kids and I biked a few miles down the road to cheer him on as he ran by and then we went on to the finish line. It was a crush of humanity, but we miraculously we found him to congratulate him. And in true dad form, he immediately handed over his medal to the munchkins. The weather couldn’t have been more perfect. The race started out in the 50’s and the high was in the low 70’s. Perfection! I drug him with me to yoga this morning to get him stretched out. He grumbled the entire way there but by the end, he was making plans to work in a class a week. I’m hoping he doesn’t find a yoga competition to sign up for next…!